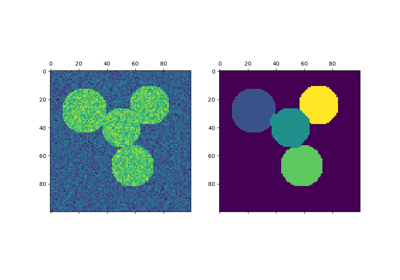 Apply clustering to a projection of the normalized Laplacian. In practice Spectral Clustering is very useful when the structure of the individual clusters is highly non-convex or more generally when a measure of the center and spread of the cluster is not a suitable description of the complete cluster. For instance, when clusters are nested circles on the 2D plane. The affinity matrix describing the relationship of the samples to embed. Must be symmetric. symmetric k-nearest neighbours connectivity matrix of the samples. Number of clusters to extract. The strategy to use to assign labels in the embedding space. There are two ways to assign labels after the laplacian embedding. k-means can be applied and is a popular choice. But it can also be sensitive to initialization. Discretization is another approach which is less sensitive to random initialization. See the ‘Multiclass spectral clustering’ paper referenced below for more details on the discretization approach. The labels of the clusters. The graph should contain only one connect component, elsewhere the results make little sense. 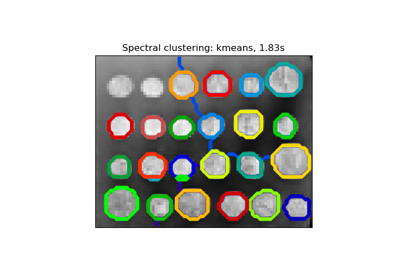 This algorithm solves the normalized cut for k=2: it is a normalized spectral clustering.